Amalgam filling replacement can be done for several reasons. 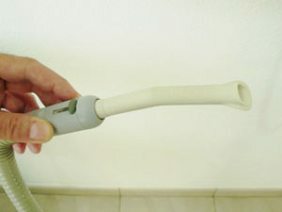 Obviously, the most common reason is that the existing filling is leaking or broken. If it's left like that, you will get a cavity as bacteria get down the crack, attacking the tooth dentine, and causing toothache. 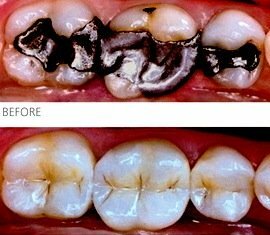 Next, you may not like the look of your black or grey amalgam fillings. They may be polished so that they look like chrome, but usually they are grey or even black! If you are considering amalgam filling replacement for cosmetic reasons, you should also think about the general color of your teeth, right now. You might need tooth whitening first! The best time to have some tooth whitening is before you get the new tooth-colored fillings! Then your dentist can match the new fillings to the lighter color of your teeth, making them invisible. I recommend the home whitening system from SNOW, available direct from their website. Finally, you may have concerns about the metals in amalgam fillings, like mercury. Mercury is well-known to be toxic, but it's important to realise that not ALL forms of mercury are poisonous. Unfortunately, the type of mercury compound released by old amalgam fillings IS toxic! But there are potential problems in amalgam filling replacement. We know that mercury release from an amalgam filling is increased by rubbing on the filling, and by heat. If a dentist just drills out the old amalgam filling, he is "rubbing" on the filling with the drill, and the friction also creates heat. If you are just having 1 or 2 fillings replaced, and you are fit and healthy, then this short exposure is unlikely to cause any problems. But if you are experiencing symptoms of possible mercury toxicity, then we need to take some extra precautions. During amalgam filling removal, there are several ways of reducing the levels of mercury vapor that you are exposed to. The obvious first step is to minimize the AMOUNT of mercury vapor generated. The second step is to PROTECT YOU from the vapor that IS generated. High volume water spray. By using a heavy spray of water over the filling during drilling, heating of the amalgam surface is minimized. Also, the dust created is washed out of the air and can be vacuumed away. Removing the amalgam filling in sections. It is possible to cut through an old filling in such a way that large chunks fall out. This is actually the most efficient way to work anyway. Limiting the number of fillings being removed at a single appointment. Doing just one or two fillings at one time reduces the total amount of vapor released in one go. OK, so the AMOUNT of mercury vapor generated has been kept to the minimum possible; how can we deal with the remaining mercury vapor that comes off the old fillings? High volume aspiration. This is just fancy dental language for a powerful suction system. This not only vacuums up the water from the drill, but also the chunks of filling, and most importantly the vapor. Obviously, it's important that the suction unit then blows the waste air outside the building! Rubber dam. 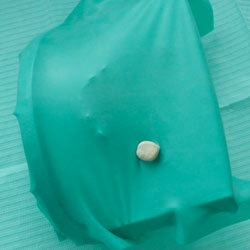 This is a little rubber or latex sheet that fits over the teeth to be worked on. The teeth pop through a couple of little holes, so we can see them. Everything else (ie. all your other teeth, mouth and throat) are behind the rubber sheet. So no bits of old filling can be swallowed, and there is no vapor behind the sheet that you can breath. Efficient room ventilation. It is important that the room is well ventilated, with air moving around the room and not being allowed to "pool" around the patient. This can be accomplished by a simple fan if air-conditioning is not available. Dedicated air supply. This is a little more controversial. If all the above measures are taken, then having a separate breathing mask with "medical grade air" has not been shown to provide any additional benefits. But some dentists feel better offering it, and I have used it when I worked in Australia. I liked it, a lot. Most dentists who work to a high standard will be using these techniques anyway. After all, the dentist is exposed to mercury vapor from removing old fillings every day! He will be concerned about his own mercury exposure, and will be doing what he can to minimize it. The final step in safe amalgam filling replacement is of course to use something non-metallic to replace the amalgam! There are several possibilities nowadays, depending on the size and shape of the cavity. The options basically boil down to composite resin or one of the many ceramics. Ask your dentist! Symptoms of Mercury Poisoning This page outlines some of the possible things you may notice if you have significant mercury poisoning. Mercury Chelation This page describes how mercury can be removed from your body, in combination with other treatments.